F'N'F BAY ROBERTS ONLY DEAL: SAVE $2,500 - Just $109 Bi-Weekly* - Sale Price: $16,299 - Reg. Price: $18,799! *(O.A.C., tax & lic. 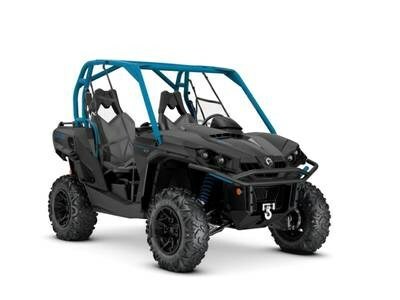 extra) 2019 Can-Am® Commander™ XT™ 800R Carbon Black & Octane Blue EQUIP YOURSELF TO RIDE ANYWHERE The right features, performance, and price—Commander XT is built with best-in-class power, a versatile dual-level cargo box, and rider-focused features perfect for the job site or the trails. Features may include: Rotax V-Twin engine PERFORMANCE DEFINED Take command of a thrilling 71 hp Rotax® 800R or 92 hp Rotax® 1000R liquid-cooled V-Twin engine with four valves per cylinder and single overhead camshafts featuring twin fuel injectors that optimize fuel delivery into the combustion chamber for powerful yet precise performance. Intelligent Throttle Control (ITC) READY TO DANCE The Can-Am Intelligent Throttle Control (ITC) throttle-by-wire system ensures smooth power delivery via precise control of its 54 mm Bosch† throttle body—even if the driver's foot is bouncing due to rough terrain. ITC detects unwanted bounces and filters the input, with selectable progressive and Sport modes. Torsional Trailing arm Independent (TTI) rear suspension STAY IN CONTACT You're looking at the only independent rear suspension that eliminates scrub and camber changes, meaning the wheels pivot up and down rather than in a butterfly motion. This ensures the vehicle moves only in the direction you point it. Reconfigured for improved traction and optimal transfer of power to the ground. Double A-arm front suspension with sway bar TRUE FEELINGS The Can-Am Commander's Double A-arm front suspension is designed with dive-control geometry that works to eliminate diving under heavy braking and rough terrain. The front end features 10 in. (25.4 cm) of travel and five-way preload-adjustable motion-control shocks.